I love crows. When I was a child we had a pet crow, Joe, who sat on the back of our living room sofa (where my mother always kept a diaper spread) and talked. He had a limited vocabulary; he mostly said, "My name's Joe!" and "I'm a good boy!" But sometimes he would utter a hilariously long and drawn-out "Ww...ow!" I believe he learned this by watching the Banana Man on "Captain Kangaroo." 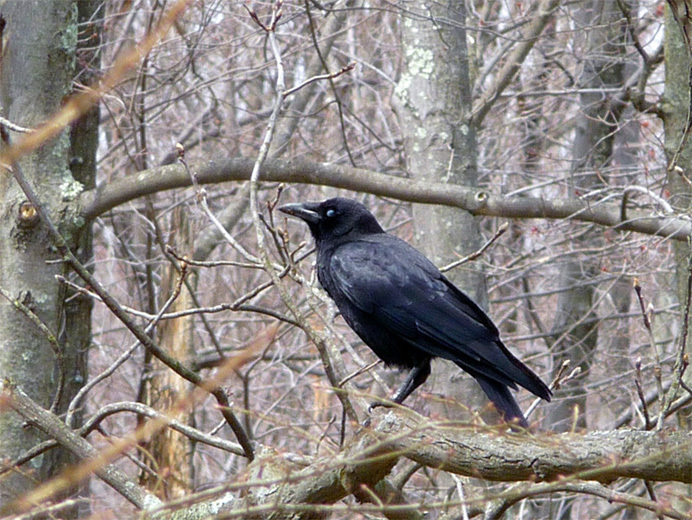 The crow in today's picture sat only about 20 feet from me, and as you can see, eyed me warily. Crows generally don't mind your walking past them at that distance, but if you stop to look at them, they fly away. This suddenly makes them seem eerily human, as if they know what you're thinking. Crows also have what my grandma called "an attitude," meaning a certain air of sarcasm. If this one could have talked, I believe he would have jeered, "Take a picture! It'll last longer."